SKU CE01 ISBN 9781589944961 length 11.75 in. width 11.75 in. height 2.75 in. Colonize the galaxy in Cosmic Encounter! This game of interstellar exploration, negotiation, and conflict invites three to five players to lead their own unique alien civilizations as they seek to spread across the stars. But every planet is ruled by someone, and the only way to expand your cosmic colonies is through either diplomacy or war. By establishing colonies on five planets beyond the reaches of your home system, you will safeguard the future of your species and earn victory. But if you fail, you will fall into the black abyss of space! 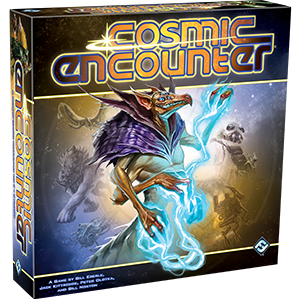 Every game of Cosmic Encounter is different, and the tables can turn in an instant. Forge your alliances, outwit your enemies, and spread your colonies across the galaxy!